Latest News: The Labrador Retriever has once again proven to be a family favorite. According to the AKC, and its 2017 statistics, the Labrador Retriever remains the champ for the number of registrations & has held the #1 spot for 26 consecutive years - thanks to its well-earned reputation for playfulness and loyalty and its use as a police and search & rescue dog. The gentle, intelligent and family-friendly Labrador Retriever from Canada continues to be the most popular breed in the United States, according to AKC® registration statistics. This versatile hunting breed comes in three colors – yellow, black and chocolate – and because of his aptitude to please his master they excel as guide dogs for the blind, as part of search & rescue teams or in narcotics detection with law enforcement. 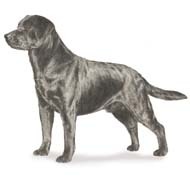 Labrador Retrievers, originally from Newfoundland, were initially used in work alongside fisherman, helping to pull in nets and catch fish that escaped from fishing lines. After being crossed with Setters, Spaniels and other Retrievers, the Labrador Retriever honed its skills as a true retriever. From this point in the breed’s history, "Labs," as they are affectionately called, were bred primarily to perform as an efficient retriever of game, with a stable temperament suitable for a variety of activities beyond hunting. An ideal sporting and family dog, the Labrador Retriever thrives as part of an active family or as a trusted hunting companion. A double-coated breed which sheds seasonally, regular grooming keeps his coat at its water-resistant best. Because of his even temperament and trainability millions of Americans own a Labrador Retriever as a pet.